Stand-in Horsham captain Will Beer was pleased with his young sides' performance as they picked up a five-wicket away win against Middleton. 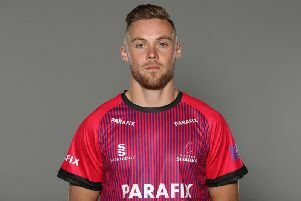 The Lions were missing skipper Michael Thornely, Tom Haines and Craig Gallagher so youngsters Rhys Beckwith and Tom Johnson stepped up to maintain Horsham’s five game unbeaten Sussex Cricket Premier Division run. The hosts won the toss and elected to bat and posted 198-8 off 57.5 overs, with Middleton captain Sean Heather (56) top-scoring. In reply, the Lions made 200-5 off 47.3 overs thanks to a knock of 65 from Nick Oxley. With Horsham extending their unbeaten run, Beer was pleased that his much changed side performed well. He said: “To go away from home, not used to the conditions and without our captain, I thought we played really well. Beer (4-63) took an early wicket but a 63-run second-wicket knock from Heather and Jack Dawling (33) got the innings back on track. A further 62-run third-wicket partnership between Heather and Mahesh Rawat (40) was ended by Beer, before Rawat was taken by Joe Ashmore (2-49) at 153-5. After the loss of Rawat, Middleton faltered as Beer and Ashmore produced a key bowling spell that restricted the hosts to 198-8. Horsham lost Beckwith (13) early before Johnson (33) and Beer (14) went in quick succession but a 64-run fourth-wicket partnership between Oxley and Garton (38) got the Lions back on track. This was followed up by a 53-run fifth-wicket knock from Oxley and Ashmore (19), which was ended by Rawat (1-30), before Oxley and Mika Ekstrom (seven not out) saw the visitors home. Beer added: “It was nice to have George (Garton), he’s a very nice luxury for us to have every now and again on a Saturday, and he bowled really well with Mika (Ekstrom). “We managed to get their overseas player and Sean Heather out and we built good pressure on all the other batsmen to restrict them to 198. “Nick (Oxley), as he’s done all year, caame in and steadied the ship and played really calmly and was positive when we needed him to be and I never thought we were going to lose whilst Nick was out there and in control. Up next for Horsham is a derby game at home to league leaders Roffey and, with the Lions in good from, Beer is excited about his sides chances. “Roffey are a really good team. There’s a little more of an edge on it as it’s a local derby. We’ll go into this home game looking to try to turn one of the teams at the top of the league over.